This chic blouson top’s main attraction? A scattering of embroidered stars. Constructed from a soft jersey base with a chiffon layer, it drapes beautifully from the crew neck to the elasticated waist. Bell sleeves are a final flourish. …dress really nail casual and smart dress codes? We reckon this versatile style can. 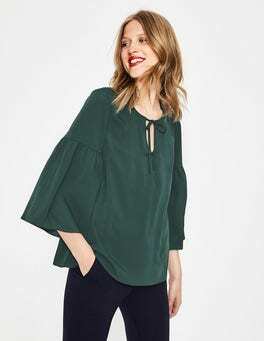 Think elegant luxurious satin-backed crepe for comfort, fluted sleeves and placement print to make a statement and a high neck to keep things smart. Because it's so soft on your skin, there’s no bulky lining, either. Introduce your wardrobe to boho spirit (and plenty of good vibes) with this bell-sleeve midi dress. The drapey fabric is crafted into a wrap V-neck shape with a gathered waistband for a flattering, feminine fit. And there's a bit of stretch too, ensuring maximum comfort.